The page title should be shorter than 580 pixels. It is currently 611 pixels long. There are different language information within the page markup. 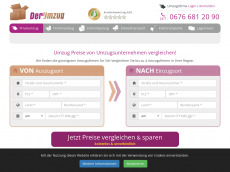 Test up to 1.000 webpages of derumzug.eu with our free plan! There are only 15 words on this page. Use at least 250 words to provide useful information. 40% of the text are stop words. No internal links were found. The file size of the HTML document is fine (2 kB).